"Clear, Concise Actionable Steps To Work Your Way Up To Approaching Women"
This is a great course for guys who are struggling with extreme anxiety when it comes to approaching women. Easy to implement, it focuses on incremental improvement and gradually desensetizing you to the idea of talking to women in everyday situations. Contains audio recording of the author approaching women in live situations. This is really only for absolute beginners; if you're able to approach women already you will get little value from this course. Doesn't cover the topic of flirting or attracting women. Listening to the same conversational openers again and again gets a bit monotonous. If you have real trouble approahing women, this is definitely worth checking out. It's designed to slowly get you over your fear of talking to women, and provides realistic exercises that you can practice that will help you get over your anxiety. If you follow the advice here you will feel more comfortable about approaching women, but in terms of getting any success beyond just approaching, the advice here is quite limited. Eric Disco is a guy who used to suffer from extreme social anxiety and was unable to talk to women he didn't know. 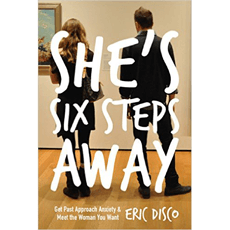 She's Six Steps Away is his account of how he learned to deal with his anxiety and, impressively, how he taught many other guys to do the same. When it comes to approaching women, many guys feel somewhat anxious at the thought of talking to a woman they don't know. But for some guys, this level of anxiety is so extreme that it prevents them from ever taking any action whatsoever. This is who the book is designed to help. Rather than just telling you to go out right away and start trying to have conversations with women, Eric lays out a plan to slowly desensitize yourself to the negative feelings you experience at the prospect of approaching women. So you might first start out by putting yourself in the same vicinity as attractive women, just being near them but not trying to talk to them. This removes any pressure while at the same time gets your body accustomed to moving towards an attractive woman when you see one. From there you gradually take more and more action over time as your confidence increases and your anxiety decreases. Done this way, even the shyest person should be able to work up to starting a conversation with a stranger. What Happens After The Approach? There's a lot of emphasis in the book on having short, innocuous conversations with women. For the purpose of getting past your approach anxiety, this will be quite effective. But when it comes to getting results with women such as phone numbers and dates, it's not quite as solid. Once you use the steps here to overcome your approach anxiety, you'll likely need to find some other information that will focus more on what to do next, specifically in the area of attracting women. The subject of rapport is covered here in great detail, with some great advice on how to form connections with women. The problem I see many guys facing if they use all of the advice here is coming across like too much of a 'nice guy'. Some of the openers are quite weak and indecisive, and more or less put you on the back foot right away. If you follow this up by moving straight into rapport and forming a connection, there is only a slim chance of the woman being interested in you in a romantic or sexual sense. Instead, there really needs to be some flirting and challenging going on, to create some sexual tension. This is something that is lacking completely in this book. So the advice is great up to getting you to approach and take action, but after that becomes less effective. The last section of the book covers the area of approaching women directly. This is something that most guys will have to gradually work up to, but IMO is the most effective approaching strategy out of all those described here. Eric himself says that he often feels better when approaching directly and many of his best clients feel the same way. The book comes with bonus audio recordings, which are of Eric approaching women in various situations. They're divided up into segments to correlate with each of the individual six steps that you learn about in the book. The audio quality is very good, which is a plus. It's great to be able to hear the steps put into action, and to see how simple it can be to approach a woman you don't know. Most of the openers are quite functional, meaning the only purpose they hold is to begin a conversation. In terms of wanting to actually pick women up, I wouldn't recommend most of these openers. It also gets a bit tedious hearing the same few openers used repeatedly. There are times in the interactions where Eric's reliance on scripted material, or 'routines', really stops him from moving forward. You'll hear through the audios that he has a few select stories that he likes to say again and again. Which can be fine for when you are starting out and you can't think of what to say next, but many times here it has a detrimental effect. Like the woman he is speaking to offers something up in the conversation, and instead of riffing off of that he goes to the default routine that feels out of place or forced. So be aware of relying too much on scripted material, and try and steer away from that as soon as you can. From my point of view the interactions that seemed the best were the ones where he opened the woman directly. That set the right frame from the start and made it less awkward for continuing the conversation. However there were some solid interactions that arose from what might be considered boring openers, which goes to show that some girls are just going to be into you no matter what you do, and it's better to say anything than nothing. There are also some bonus interviews that make up this course. They feature Eric talking to various dating and seduction teachers about a number of subjects that directly relate to the six steps. Some of the interviews are better than others, but it's a nice bonus. Overall I'd recommend this to guys who are stuck at the stage of approaching women. If you have any experience beyond that level, this isn't really for you. If you have real trouble approaching women, this is definitely worth checking out. It's designed to slowly get you over your fear of talking to women, and provides realistic exercises that you can practice that will help you get over your anxiety. If you follow the advice here you will feel more comfortable about approaching women, but in terms of getting any success beyond just approaching, the advice here is quite limited.